An Old Malt Cask from Hunter Laing with the cask number HL 10128. Only 348 bottles were made. Sweet rubber and ashes at first in the smell. Some salt and white fruits as well with hints of coconuts, but I keep getting back to the sweetness! Very rough at first in the taste. In the good way! Peat, ashes and burned oak. The finish is warm and the peat gets a bit vanilla sweet but in the same time mixes with some rubber. A bit strange feeling… Some wet grass as well. Like standing on Islay. I wasn’t all that impressed to begin with, but after the first dram it started to grow on me! 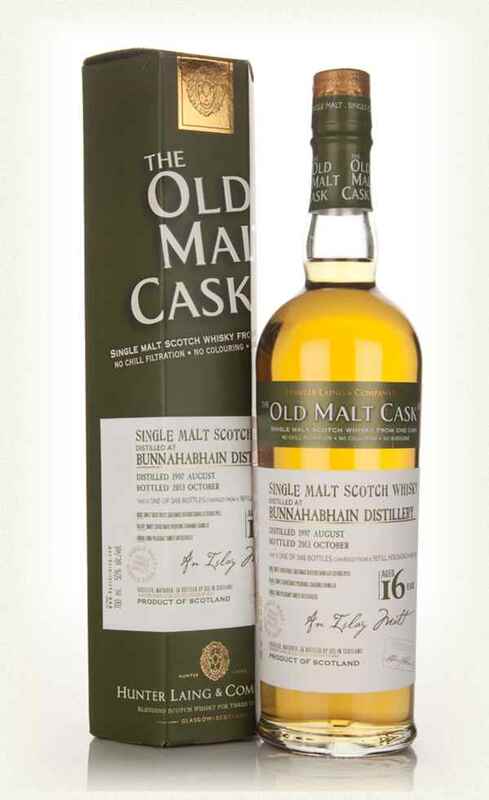 A very earthy, farmer-style Bunnahabhain. Water seems to settle it all the way around, but doesn’t changes much. I will give this 85/100 (21/22/21/21).